Arthur Pewty's maggot sandwich: Bexley CAMRA. I took the two photos above (click on either for a larger view) at around 9pm on last Monday evening. They show fly - tipped waste that was illegally dumped at the Council recycling facility behind Morrison's in Erith, at the end of James Watt Way. The site is a favourite location for local criminals to dump waste, as it is quickly accessible by van, it is relatively out of the way and unobserved, and it can look like they are genuinely depositing materials for recycling. As you will see from the lower of the two photographs, not only was domestic waste dumped, but a large amount of industrial electrical cable waste; it would appear that the criminals had stolen some high voltage electrical cable, then stripped off the outer insulation material, and then the steel armour strips that surrounded the valuable copper core. They have dumped the insulation and the steel armour, which can be clearly seen above. The waste has now been cleared from the site. Bexley Council have recently announced that they have purchased a number of stand alone CCTV units which they intend to use to target fly tippers. I am already aware that the Erith Morrison's recycling site is one of, if not the worst site in the borough in relation to environmental crime; it would seem to me that a permanent camera mounted on one of the street light columns close to the site would be a very good way of catching those criminal tippers. One issue that has been highlighted is that many of the vans doing the illegal tipping are themselves either stolen, or have false or stolen number plates attached to them. Commercial operators (basically any person not in a private car) taking waste to be legally disposed of at a council run recycling centre such as the one at Thames Road in Crayford get charged heavily for legal tipping. A single Transit – type van full of waste can be charged over £100 for a single tipping visit at a licenced waste disposal site. I have spoken to the Council about this. 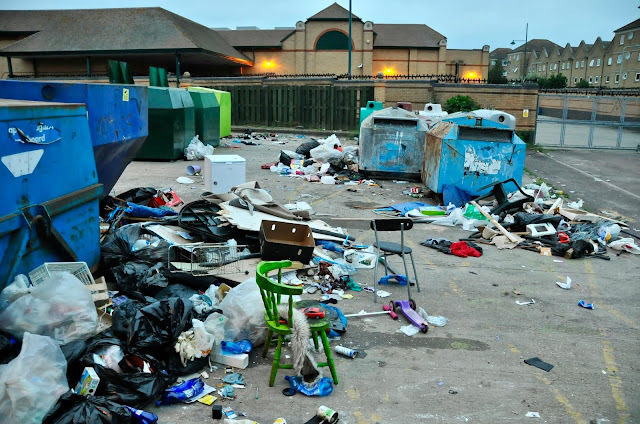 I understand that when illegally tipped waste, such as that dropped at the Morrisons site is cleared up, it is done by a council subcontractor, who charges the council over £300 for the work. 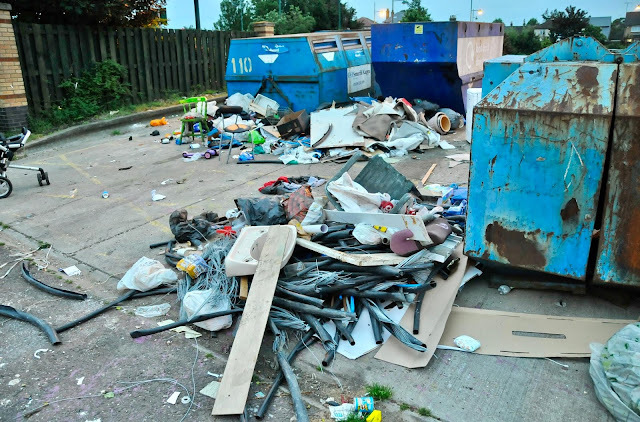 Basic arithmetic would dictate that it would be cheaper for the council to allow waste dumping to be carried out by traders for free, rather than to have to clear up the illegally tipped waste at a later stage. I would propose a six month trial period where commercial waste tippers were not charged for using the Crayford dump; in all other ways they would still have to comply with the existing waste disposal rules, and the content of their loads, the company name and vehicle registration number would still be recorded, but no money would change hands. If at the end of the trial, the amount of fly tipped waste had substantially reduced around the borough, then the scheme would be judged a success. I think a pragmatic approach may be worth trialling, as the current system does seem to be failing, and the amount of council tax payers money spent on clearing up after the illegal tippers could be far better spent elsewhere. Don’t think I am opting for a soft approach to criminal activity – I am still strongly of the opinion that catching and prosecuting fly tippers should be a high priority, but a mixture of both carrot and stick, rather than stick alone may deliver better results for both the environment and the council taxpayer. This issue comes at a time when Bexley Council is having severe problems with its refuse collecting contractor, Serco. The contractor has been complaining of staff shortages, meaning bins in certain parts of The London Borough of Bexley have in certain instances not been emptied when they were scheduled to be. It is ironic that bin services are suffering at a time when councillors in Bexley have just voted themselves a substantial pay rise. I somehow doubt that anyone familiar with the main local characters in control of Bexley Council will be surprised by this move. Did you know that in the very early 1980's several radio stations, including BBC Radio 4 transmitted programs for popular 8 - bit home computers over the airwaves, to be recorded onto audio tape by the receivers before being loaded into their home computers? It later turned out that instead of being a pioneer, the British actually came quite late to this party. The idea was simply to find out if disseminating computer data over radio bands set aside for talk and music would even be feasible. This was a couple of decades before WiFi was available to the general public, and using the ordinary AM and FM radio broadcast bands, rather than anything specifically set up to transmit computer data. One of the British pioneers of this technology was a chap called Simon N. Goodwin who was also experimenting in transmitting computer programs over the airwaves. Simon had been writing games and articles for home computing magazines since 1979, and in 1983 his ZX Spectrum game Gold Mine had just gone into the All Formats Top 20. He was also the co-presenter of the Computer Club show on Radio Wyvern, and in December 1983 he programmed an animated ‘Christmas card’ in BASIC to be sent out to the listeners. The card was sent out in two versions, one for the Sinclair Spectrum and one for the Tandy TRS-80, both complete with music and prancing reindeer. But could the listeners download it? “It worked for some people, but not everyone who tried was successful, especially the TRS-80 version, which was a relatively error-prone format (though a third of the speed of the ZX version). One person managed to read the TRS-80 version on a Nascom, a very different (British, bare board) system which was popular in the UK at the end of the 1970s, but that took some quite ingenious machine-code programming.” Simon found that, as would be expected from the higher bandwidth, listeners were more successful at downloading on FM rather than AM. Simon came up with the idea for transmitting his Christmas card after reading an article in Personal Computer World magazine earlier that year about a Dutch station broadcasting the ASCII text of programs. However, it turns out that the Dutch were transmitting computer programs a lot earlier than 1983: the domestic radio show Hobbyscope (or Hobbyscoop to give it its Dutch name) was sending code over the airwaves as far back as 1980. Indeed, Hobbyscoop transmitted programs throughout the 1980s, and the makers of the show even came up with a way to avoid broadcasting a program multiple times in different versions for each different home computer. The solution was the BASICODE format, which could be downloaded onto any home computer running BASIC, as long as the user ran a translation program first. The UK and the Netherlands were not the only countries enjoying the excitement of downloading programs from the radio: in fact, the craze took off all over Europe. In Finland, Kai R. Lehtonen was inspired by the Dutch broadcasts and attempted to do something similar on the YLE public radio station, and in 1985 his team succeeded in broadcasting a program that was downloaded 600 km away from the station. Perhaps some of the most enthusiastic early downloaders were to be found in Serbia, then a part of Yugoslavia. 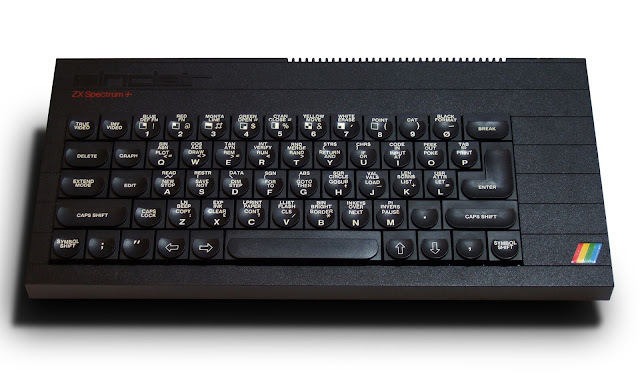 Zoran Modli, who hosted the Ventilator 202 show on Radio Belgrade, was approached by the editor of the Galaksija computer magazine with idea of sending a ZX Spectrum program over the airwaves. Zoran remembers broadcasting for the first time: “Both me and my radio team were very excited. I had to inform the Radio Belgrade technicians who were on duty at remote radio transmitters that for the next few minutes only hissing and growling would be heard. Lay people were confused and wondered, ‘What is this lunatic doing?’ But those who listened and understood excitedly contacted us by telephone to say they had successfully loaded the program onto their computers!" The death knell of these over the air computer program transmissions was quite simple - as the price of floppy disk drives for the major home computer brands fell, the popularity of using audio cassette tapes for program storage and retrieval declined rapidly. Technology moved on, and the slow transmission rate and relatively small file sizes supported by over the broadcast radio spectrum transmissions became too much of a hindrance, and the whole thing was quietly dropped. Some readers are surprised at the amount of time I spend working on each weekly update of the Maggot Sandwich; on average each update takes around ten hours of work to research, write, edit, create web links and metadata for. Much of the time is spent in research – I try to ensure that I report on facts, not suppositions, and bearing in mind I am both reporter and editor this can on occasions be extremely difficult. In the last week a major row has broken out between the owners of The Kentish Belle Micro Pub in Pickford Lane, Bexleyheath, next door to Bexleyheath Station, and certain members of the volunteer team that run the Bexley branch of CAMRA - The Campaign for Real Ale. The two sides are at odds with each other regarding some of the policies the CAMRA as a national body has put in place. The landlord of The Kentish Belle recently wrote on the micro pub's website:- "When we opened our humble Micro Pub in March 2018, it was a day of great fanfare. We have, quite incredibly, hit our 'big target' of 1,000 pints sold per week which is something that we are extremely proud of. We are also continuing to buy cask ales that are more expensive than 'average' as part of our commitment to the fair price for cask ales and also supporting breweries that produce the very best beer. Our key problem, however, has been CAMRA's complete lack of desire to fight against one of their key stakeholders (? ), Wetherspoon. It is hardly right that CAMRA should try to court a relationship with Drinkers' Voice to fight against the anti-alcohol lobby and promote responsible drinking when they also 'promote' pints at £1.79 instead of the already cheap £2.29, as an example. This doesn't seem at all a promotion of responsible drinking to us. We have therefore decided that whilst we will consider continuing to advertise in CAMRA London Region's 'London Drinker' magazine, as well as other CAMRA publications and beer festival materials locally, this is not going to be out of duty to CAMRA. 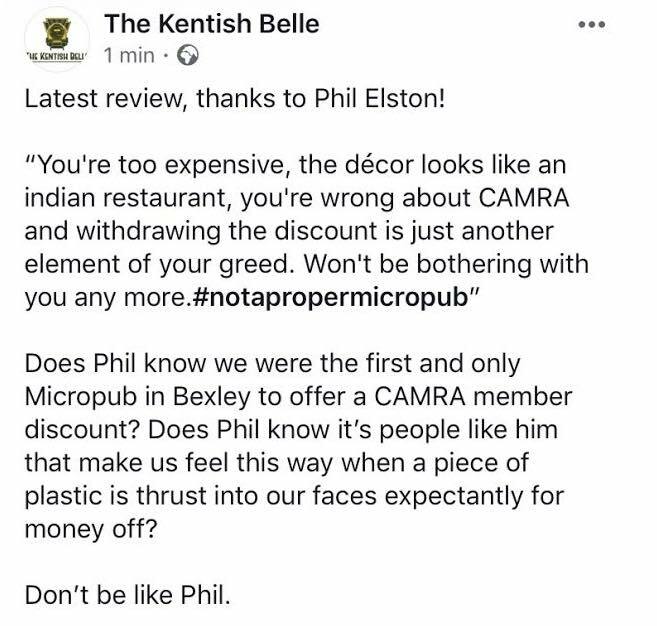 We're also going to withdraw the CAMRA discount scheme we operate at the Kentish Belle as we don't feel it right to offer a discount to people who rarely come when our regular customers are paying full price. Moreover, we would hope CAMRA members would come for the fantastic beer we offer instead of for discounts - and they have vouchers to aid them in this regard. The Landlord has also resolved not to be on the Branch Committee in Bexley at the upcoming AGM which all Bexley members are encouraged to take part in. The Landlord supports the current Chairman, Roland, and hope he runs again despite not having received the best of support. In Medway, for example, their Chairman has also stood down because of bitter in-fighting and we feel more comfortable as a small business representing itself and knowing it serves fantastic beer without needing the validation of CAMRA which, locally and nationally, is looking weaker by the day. We hope CAMRA members will understand what it is that we have done, and we aren't ruling out bringing the discount scheme back in future if positive and real change is made to CAMRA with better diversity and with real local support". Phil Elston - a CAMRA member - though apparently not on the committee, wrote the opinion piece that you can see in the screen capture above. It is all getting rather childish and silly in my opinion. I understand that Bexley CAMRA may well be imploding over this and a number of other rather trivial issues. Personally I feel that this is a very sad position for them to have found themselves in; I have spoken to a number of people from differing viewpoints on the current situation, and it seems to me that it may well be time for Bexley CAMRA to undergo a drastic reorganisation, and for an influx of new people with new ideas to come forward. It is very easy for a long standing group of people in any enterprise to become stale and stuck in their ways, and it is always a challenge in such a situation to know when it is time to let someone else take the reins. Bexley CAMRA have done a lot of good in the last couple of decades - not least in the establishment of Bexley Beer Festival, an annual event that has continually grown, and is now a high point in the social calendar for many people. Unfortunately, in-fighting and some very undignified back - biting and nastiness among what is only a very small handful of individuals would seem to have soured things for the rest. If you have any deeper insight into the current local situation, please get in contact - your identity can be kept completely anonymous, should you so wish. What characteristic do you suppose that I share with the following celebrities? Elton John, Simon Cowell, Tyra Banks, Tom Cruise and Sarah Jessica Parker? In the last week, the tabloid press have picked up on the story that Simon Cowell had ceased using his mobile phone as he found constantly checking it increasingly stressful. The other celebrities listed do not use mobile phones, though I would expect that most of them would have staff who use mobile phones on their behalf. As previously stated, I don't have a problem with people who want and enjoy using mobile phones; what I do find irritating is the widely held expectation that everyone should have one. It is now widely accepted that over - use of a mobile device - especially during the hours of darkness can lead to sleep disturbances and changes in brain chemistry, which in turn can affect mood and levels of stress. If you want to use a mobile phone, absolutely fine. If you decide that they are not for you, I see no reason whatsoever why this should not also be regarded as just as fine. My old saying of "If it works for you" seems to fit this description well. What do you think? Leave a comment below, or alternatively Email me at hugh.neal@gmail.com. Work on the African restaurant located in what used to be the bar area of The White Hart in Erith High Street continues apace; at the rate of work, it will not be very long before the place is ready to open. I sincerely hope that the owners ensure that the restaurant appeals to all sectors of the local community, rather than exclusively to locals of African or Afro - Caribbean descent. As I have previously mentioned, a mistake that I feel that many African restaurants make is to "preach to the converted" and only reach out to within the Nigerian / West African parts of the community, rather than promoting their restaurants to one and all regardless - something that Bangladeshi and Pakistani people did in the 50's and 60's when they set up "Indian" restaurants around the UK - and subsequently made an absolute fortune in the process. I would like to see the owners of the new restaurant in The White Hart reach out to the wider community of Erith and the surrounding areas. One of my readers is a lady called Judith, who is part of the African and Caribbean community; she forwarded my thoughts on the lack of general inclusivity in Afro - Caribbean restaurants to one of her colleagues, who commented:- "I agree with Hugh….. African restaurants tend to only cater for the Afro Caribbean community". 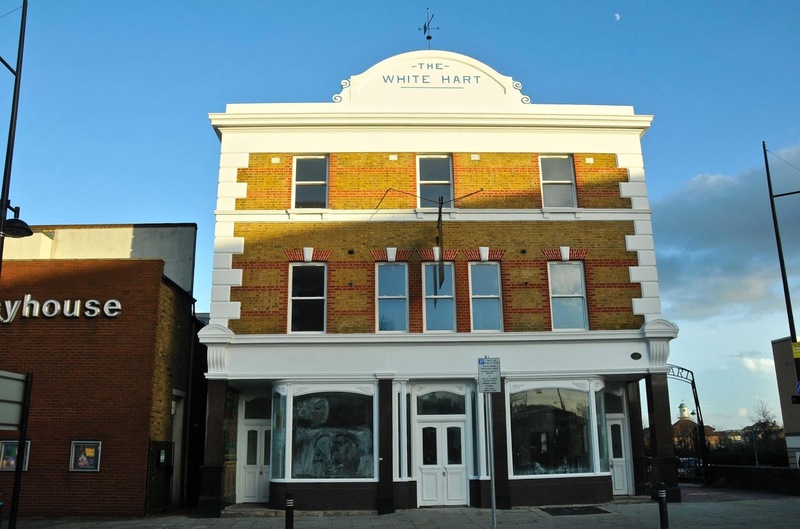 Perhaps now is an opportunity for the owners of The White Hart restaurant to open it to include all local people, not just one specific group. If handled well, this could be an opportunity for true inclusivity - something surely to be welcomed now that the 70th anniversary of the arrival of the HMT Empire Windrush at Tilbury port in 1948 is about to be celebrated. To not do this would not only be a shame, it would mean that the owners of the African restaurant were shutting off a large part of a potential revenue stream. What do you think? Leave a comment below, or Email me at hugh.neal@gmail.com. Events seem to be gathering some momentum in respect of the Crossrail to Ebbsfleet (C2E) proposed extension. The Thames Estuary Commission is reportedly poised to recommend to Government that Crossrail should indeed be extended to Ebbsfleet. The Crossrail to Ebbsfleet (C2E) campaign seeks to extend Crossrail 1 (the Elizabeth line) to Ebbsfleet International along the route of the existing North Kent Line, which would create a major new interchange with London. The programme was submitted to The Thames Estuary Growth Commission, which considers options for enhancing opportunities in the Thames Estuary, in March this year. The Bexley Times have reported in an interview with Bexley Council Leader Teresa O'Neill in which she said of the decision:- "It is encouraging to see support for the extension growing so strongly and swiftly – with the government, businesses and the engineering community independently recognising the potential to transform this part of London and Kent. If the Thames Estuary Commission recommends the C2E extension, it will add a powerful and respected voice to those in Government and across the region calling for us to finish the job on Crossrail.” Councillor O'Neill's comments are not unexpected, as she has already "bet the farm" on the C2E project going ahead; many of the proposed future infrastructure projects outlined in the recent Bexley Growth Strategy Document rely on Crossrail to Ebbsfleet going ahead. Without this development, many of the other proposed changes to the borough simply would not be able to happen. The Thames Estuary Commission is expected to publish its report on June 25th. The weekly local safety and security updates from Bexley Borough Neighbourhood Watch Association. Firstly from Barnehurst ward:- "Another good week to report back to our residents on Barnehurst Ward. There have been no reported Burglary’s and no incidents of vehicle crime. We have had an incident whereby a resident has paid in full for garden work to be carried out however following a payment being made the workmen failed to return to complete the job. Please be careful when taking on gardeners or builders, look for reputable company’s and check out the company before work commences. Please join the team at 01.00pm on Thursday 14th June 2018 at Barnehurst Golf Club for any crime prevention advice. 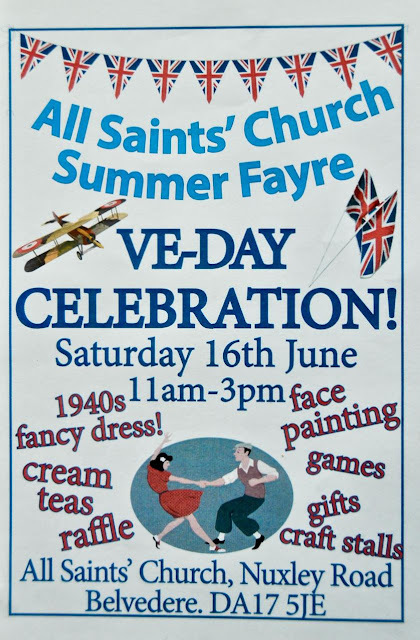 We are happy to take on board any burning issues you may have or if you would like to come along just for a friendly chat your more than welcome". Belvedere ward:- "Hello all, apologies for a missed update last week – we have had a busy few shifts. We have managed to locate a couple of stolen vehicles. A positive stop and search resulted in a known male being issued with a warning for drugs possession. In line with our priority on drugs we seized 15 bags of cannabis and 3 bags of a white powder believed to be cocaine. A warrant we conducted earlier in the year has gone to crown court meaning the drug dealer concerned potentially faces as substantial custodial sentence. We have worked hard to put together a comprehensive case file to support the CPS to secure the sentence. We have been investigating a burglary and have identified 1 suspect with 1 remaining outstanding. Following an ongoing ASB issue in Draper Close one male has been issued with an Community Protection Notice warning, we are due to issue more Acceptable Behaviour Contracts m the near future. We have also been conducting numerous arrest enquiries ensuring wanted offenders are being chased regularly. The team have adjusted our shifts this weekend so we will be working later to tackle ASB issues in Belvedere. Vehicle ASB calls in Belvedere are substantially lower so far in 2018 compared to 2017 – 83 percent lower in fact! ASB calls are also down. We are keen to stay on top of issues, particularly through the summer months and want to hear from NW Coordinators about any recurring or emerging issues. Please contact us on 020 8721 2050 or email Belvedere.SNT@met.police.uk if you would like to alert us to any such issues. Thanks all!" Bexleyheath ward:- "The team are patrolling areas of ASB on the ward which includes park areas as we have had several reports of gatherings and graffiti being found. Reports have also been reported to us in relation to anti-social behaviour in Brayside Crescent Bexleyheath. Patrols are being conducted as much as possible to resolve the issue. We have had four stopped in the cinema car park with cannabis and all four have been dealt with accordingly. Car parks areas are also incorporated within our patrols hence why we had come across this particular group. Recently we had one arrested for a theft of a watch from Earnest Jones with a value of £4850. A purse was reported as stolen from within Primark on the 05/06/2018. A vehicle was reported stolen along Belvedere Road Bexleyheath between the 4th June and the 5thJune 2018. Another report had also come through as number plates had been stolen from a vehicle along Gravel Hill Close. Any NHW members that now come under our team because of the new ward boundaries, please feel free to make contact with us so we are aware to help aid communication. If you want to pass on information to Police then please feel free to contact Crimestoppers on 0800 555111". Crayford ward:- "On Monday 28th May between 15.00-22.00 a front lounge window was smashed in Thames Road, on the same day French doors were smashed at an address in Wyatt Road at about 17.00, no one was identified and they appear to be random criminal damage. On Saturday 26th May, it is believed that an attempted burglary took place at Shearwood Crescent, the inner porch door was unlocked and it was believed the outer door was locked. The owner was upstairs and heard a sound, on coming downstairs the inner porch door was open, nothing was disturbed or believed to be stolen. On Tuesday 29th May between 18.30-19.30 a Blue Hyundai saloon had the driver’s window smashed outside Crayside Leisure Centre whilst the owner was shopping. It was reported that a Green Kawasaki, number plate DS07DEC was stolen in Alcock Crescent between 14th and 29th May. It had been chained and anchored in a secure building. From the same building between 09.00 on 28th May and 06.00 on 29th May two pedal cycles that were locked and chained were also stolen, it is unclear if these crimes are linked at this time. On Thursday 31st May between 07.05 and 21.55 the front and rear number plates were stolen from a Kia parked at Crayford BR Station, this crime has been passed to British Transport Police for further investigation. On Monday 4th June two males were arrested for drugs offences whilst parked up in a vehicle at Crayford Industrial Estate. On Wednesday 30th May, a Male reported that on that day, between 12.15 and 12.45 he had been hit over the head with a stick and his wallet had been stolen, this happened near to McDonalds. Between 16.00 on 29th May and 18.00 on Wednesday 30th May front and rear number plates were stolen off a Vauxhall Corsa, it is believed this happened whilst the vehicle was parked at Crayford BR Station. Between 17.00 on Friday 1st June and 06.00 On Saturday 2nd June, a welder, Argo gas shield bottle and Karcher pressure washer were stolen from a locked cage at Serco at Thames Road. On Monday 4th June between 09.00-12.32 a black Toyota Yaris was stolen from Green Walk, it had been left locked and secured. It activated the ANPR camera near Bluewater and was stopped and arrest made. On Tuesday 3rd June at 11.00 a white Ford Transit work van which was parked in Iron Mill Lane was found to have its front and rear offside tyres slashed by an unknown person and unknown tool. On Tuesday 5th June during the early hours in Halcott Avenue, three IC3 males were seen trying handles on cars, they were disturbed and ran off, it was believed they were trying to steal a car. On Tuesday 5th June between 12.45-13.05 a resident at Carr House, Wolsley Close had their bank card removed from their flat and it was later used to withdraw cash. The victim who is partially sighted had been befriended by the two people believed to have taken the card. Please be sure not to keep your pin number with your card or let the pin number be known to anyone else. A red Honda 125, number plate GF62FYZ that had been involved in a road traffic collision in Iron Mill Lane recently has now been reported as stolen, it had been left at the scene and was badly damaged, it would have had to be lifted to be removed". Northumberland Heath ward:- "It’s been a really good week for crime detection with many positive results. The team have been focussing on drug crime and Anti Social Behaviour using stop and search and plain clothed patrols alongside normal patrols. We have conducted up to 20 stop and searches over the last week resulting in us finding a large quantity of personal cannabis and a large knife in Erith. We are currently investigating the possession of the knife, which is to be forensically examined. We have some recent reports of ASB in the areas of Bexley Road, Northumberland Heath Recreation Ground and Walsingham Walk. We are currently working on all of these issues and focussing patrols in these areas. Yesterday we stop and searched a group of five teenagers off Bexley Road and reported two teenagers for possession of cannabis. Our colleagues form Belvedere have also recovered two stolen vehicles and a quantity of drugs from Walsingham Walk a few days ago. Apart from the ASB, which is not linked to any of the youths from last year, we have a low level of reported crime on the ward. If you are aware of any issues we have not raised here please get in contact with the team". Slade Green and North End ward:- "Unfortunately again we have had 3 overnight theft from motor vehicles in the last week and one attempted theft of a vehicle. On June 1st number plates were stolen from a vehicle in Garnet Road (Rainbow Road estate) and an attempted theft was made in Crescent Road but the suspect was disturbed. Then on June 3rd tools were stolen from a van in Peareswood Road, suspects were seen and good descriptions given. On June 4th at 10pm 2 males tried to distract a driver in Alexandra Road and steal his car. Fortunately he managed to lock the vehicle and the suspects ran away. On Tuesday PCSO Mark attended the launch of the Slade Green Seniors Cinema Club at the Community Centre. 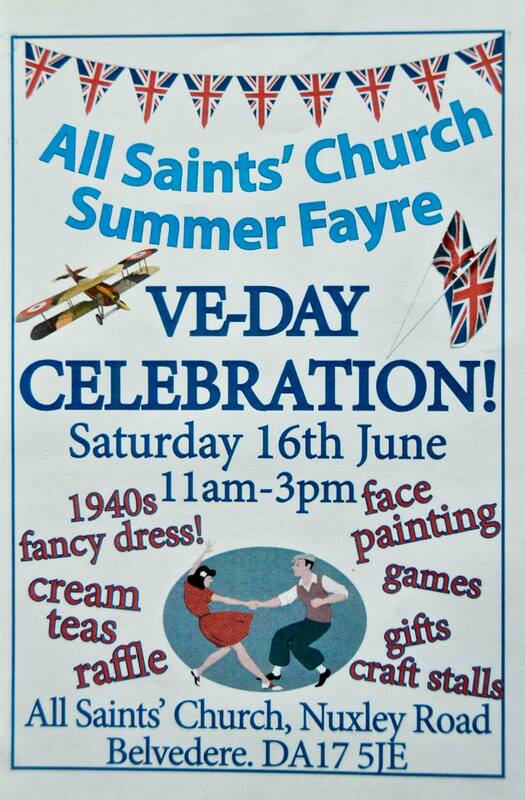 This has been funded by Orbit Housing and organised by 3 retired residents. The event was a success with attendance from local councillors, the deputy mayor and around 30 retired residents who all enjoyed tea, cakes and then popcorn during a showing of Carousel. The next film club has already been arranged and all attendees get to suggest films for future events. Our next Community Contact session is on Thursday 14th of June from 1030am in the Forest Road Café". Thamesmead East ward:- "Big welcome to PCSO Lorraine O’Hara, who has very recently joined the team. No burglaries to report this week, however there have been several reports of vehicle crime. A moped was stolen from outside an address in Howden Close, during the early hours of Tuesday 5th. Also around this time, attempts were made to break into two motor vehicles, Kale Road. On Sunday 3rd June a car was stolen from Thamesbank Place. On Friday 1st June, PC Pruden arrested for a male who was wanted for failing to appear at court. He remained in custody overnight, and was sent to court the following morning. Also on the 1st June, PC Nana and PCSO Hobbs in partnership with Peabody Housing, identified a stolen motor bike in a disused garage, Hartslock Drive. The bike was taken to Charlton car pound to be forensically examined. Good piece of proactive work by PCSO Hobbs and O’Hara, on Monday 4th June. While out on routine foot patrol, they discovered a male in possession of two cannabis joints and grinders. All items seized, and the male will be interviewed by the team later this week. The next Contact Session is Tuesday 12th June at the Link, between 11-12pm. Feel free to drop in". A little bit of history by way of the ending video this week. A news clip from ITV Thames News from back in May 1985. It shows what would appear to be fallout from the then May and Baker chemical works in Lower Belvedere causing breathing difficulties and malformed plants in local gardens. The man interviewed in the video clip with the Irish accent is the late Councillor Joe Delaney, who was a long - time local representative, and a very nice man by all accounts. Please feel free to leave a comment below, or alternatively Email me at hugh.neal@gmail.com.